Marcia, like many women, started to put on weight as she entered her late 20’s. But time she was 30 she had gained about 30 pounds. She decided after the birth of her first son that it was time to make an effort and lose weight. So she joined an Ashtanga yoga class in her home town, Chelmsford. She trained hard twice a week and also practised Sun Salutations at home every night. It took almost a year for her to lose weight and get fit really again, but she did it. 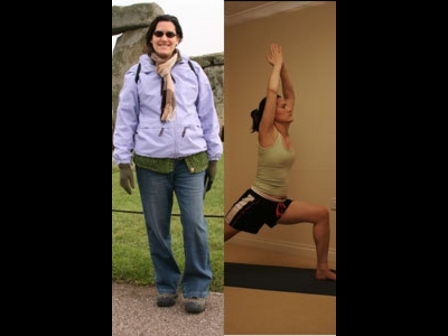 She now helps others learn how to lose weight by teaching Ashtanga through online lessons. Marcia says that in addition to regular intensive yoga workouts, it is vital to also eat a healthy and balanced diet. She cut out bread, cakes cookies and soda and ate fresh fruits and vegetables and lean protein sources. Keeping the weight off simply involves regular yoga workouts and sticking to the healthy diet. Marcia says that everyone can do it, and having children should not be an excuse, you can always make the time for yoga. Marcia runs the Yoga Mums website to help teach others how.